Last week in the Popculteer I told you about the cool new calendar that Bill Lynch and the tech crew at the Gazette-Mail have put together. Now we put it into practice. You can use this great new resource to find out about the tons of cool things happening in and around Charleston that I don’t have time to tell you about. You can see the fancy new interactive calendar HERE. Using this, you can find a darn-nearly comprehensive list of the many and varied cool things into which you can insert yourself, activity-wise, here in Charleston and the Mountain State. Come Up for More AIR! Wednesday we offer up new episodes of Life Speaks To Michele Zirkle and Marking Out with Betty Rock plus we have other special coolness awaiting you. The morning brings you replays of The Swing Shift and one hour of our special collection of local and international artists in The AIR Music Mix. At 9 AM expect a replay of the Life Speaks Eclipse Special from last Monday. 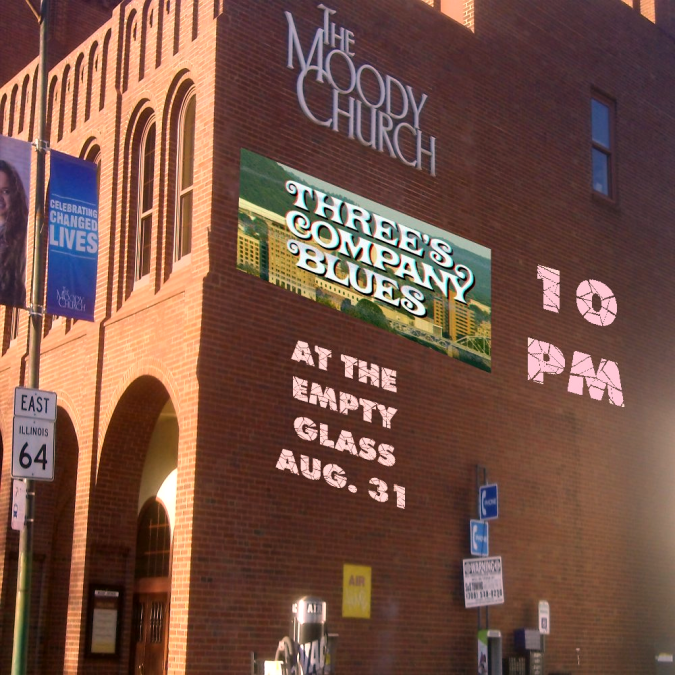 At 11 AM it’s a special presentation of an hour of early music by No Doubt. Noon sees 90 minutes of Mrs. PopCulteer, Mel Larch, first hosting a replay of Curtain Call, and then also hosting a classic episode of On The Road with Mel. At 1:30 PM it’s time for Life Speaks to Michele Zirkle. This week it’s the conclusion of the wild interview with Amanda Walker, the Psychic Hairdresser from Columbus (who also guested on the Eclipse Special). Tune in and turn on to receive your insights. You can hear a replay of Life Speaks at 7 PM. At 2 PM music takes over with Beatles Blast, followed by two hours of Curtain Call. The AIR Audio Playhouse brings you part one of a Jules Verne classic at 5 PM and our double-shot of The New Music Show and The (BS) Crazy Show follow that. At 10 PM we replay this week’s all-new episode of Marking Out, as Betty Rock and her mystery tag-team partner regale you with the fallout from the latest WWE and pro-wrestling developments, including fallout from Summerslam. For the rest of what to expect this week, just check out that nice schedule graphic that accompanies this post. I made it just for you. You can always keep up with the latest programming notes on The AIR here in PopCult. It’s our unofficial companion radio station. Monday has come and gone, and here in PopCult I neglected to observe two milestones. 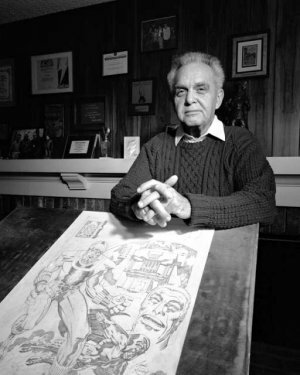 The first, and by far most important, was that Monday was the 100th anniversary of the birth of Jack Kirby. Kirby is arguably the most important creator of pop culture over the last several decades. There would be no Marvel Comics without him. The reason I didn’t post a tribute yesterday was that there was little I could add to all the well-deserved accolades that appeared all over the internet to mark his centenary. I never met the man. I had a chance once, being in the same room with him, but for once in my life I was starstruck and was too nervous to introduce myself. That’s a regret that I will carry to my grave. 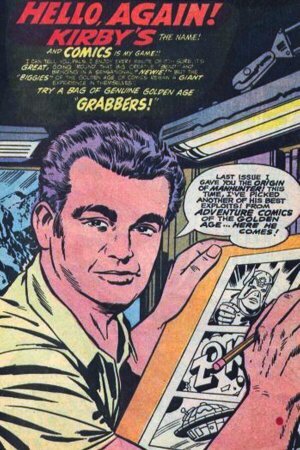 I would suggest that, if you want to read more about Jack Kirby, the best place to start would be Mark Evanier’s blog. he knew and worked with Kirby, and will be posting links to some of the best tributes. Plus his blog is a pretty good every-day read anyway. There is a bit of a debate among comic book fans over who deserves the most credit for the work credited to Stan Lee and Jack Kirby. I am firmly on the Kirby side of this debate, but I think that the contributions of Lee should not be dismissed. Lee had created the “Marvel Method” of working, mainly as a money-saving device for his uncle’s company (Stan Lee was the nephew of Martin Goodman’s wife, and Goodman owned the company that would become Marvel). Basically, Lee would give a short plot description to the artist, and let the artist break it down into a story, which would then be finished by Lee, who would write the dialogue. While many of the artists tended to enjoy this because it gave them more control over the finished product, it also gave them half of the job of the writer, with no increase in pay. Stan Lee was the editor, and as management, paid himself little or nothing as the writer of credit, saving the company a bundle by not paying writers for the work they published. At the beginning of the Marvel age, when Kirby and Lee created The Fantastic Four, Lee deserves all the credit in the world for hiring Kirby, then getting out of his way. Kirby was so intent on storytelling that he didn’t want to deal with details like dialogue and inking. He wanted to tell his story and then move on to the next story. Sometimes he followed plots that he’d worked out with Lee, oftentimes he just did what he wanted. Lee was smart enough to stay out of his way, tidy up the dialogue and hire the inker to finish the art. Kirby’s brilliance was in creating characters and telling stories. Lee’s brilliance was in selling those stories to the public. He ranks as one of the best editors to ever work in comics, and his role as a salesman and ambassador of comics is unchallenged. When you look at what Lee produced before and after his collaboration with Kirby, you can easily see that Jack Kirby was the true creative force behind the Marvel Universe. Lee fostered that creativity, but Kirby did all the heavy lifting. Looking back, some of the most cringe-worthy writing in The Fantastic Four is clearly the work of Stan Lee. Often his words don’t match the expressions on Kirby’s characters. Eventually that became very frustrating, not only for Kirby, but also for Steve Ditko, who was basically writing and drawing Spider-man and Doctor Strange by himself. With his best collaborators having moved on to other publishers, Lee essentially retired as a writer and turned the reigns over to a younger generation. Kirby, however, kept creating. 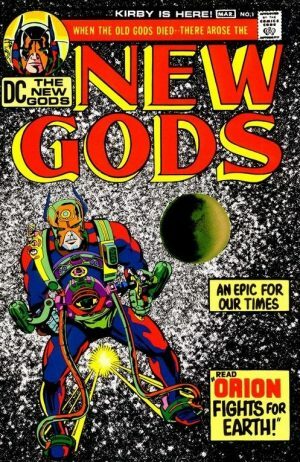 At DC Comics he came up with The New Gods, the source of the major villains in the upcoming Justice League movie, and also created Kamandi and The Demon. He returned to Marvel, and working without Stan Lee, had memorable runs on Captain America, Black Panther, Machine Man and Devil Dinosaur. Before he ever teamed with Stan Lee, Kirby had co-created or created Captain America, The Newsboy Legion, Boy commandos, Boys Ranch, Black Magic (the first horror comic), Young Romance (the first romance comic), Fighting American and Challengers of the Unknown. The fact that both Marvel and DC are leaning heavily on concepts that he created for their movies, television and animated programs is a testament to his lasting legacy. I’ve been writing about Kirby’s influence on pop culture since almost day one of this blog, and it’s clear that a world without Kirby would have been a much more dull place. And speaking of “since almost day one of this blog,” there was another milestone I missed yesterday. Monday was the twelfth anniversary of the very first post in PopCult. It doesn’t seem like it was that long ago. I think PopCult is now the longest-surviving single-author blog at what is now the Charleston Gazette-Mail, and it’s been a fun trip. It has to have been, since they stopped paying me in 2008. So thanks for reading, and let’s see how much longer they’ll let me get away with writing this stuff. New Byzantine and Bobaflex on RFC! 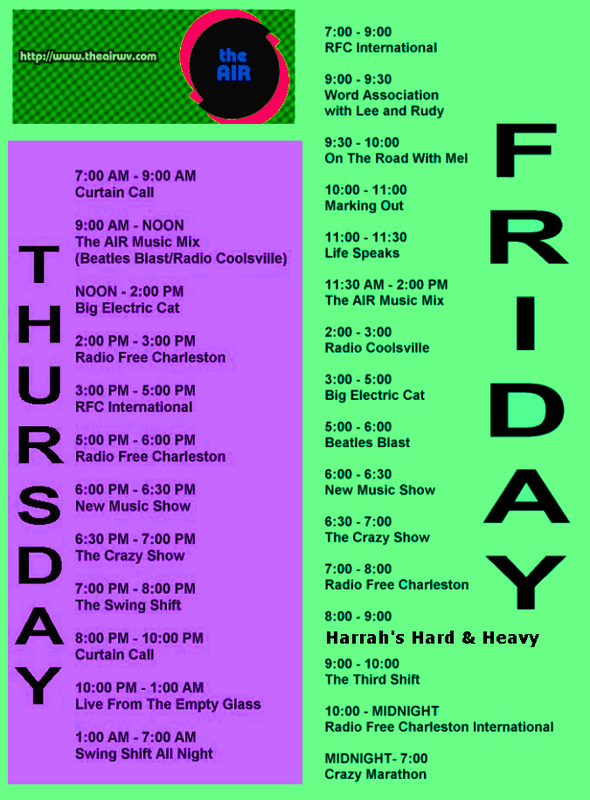 Following the morning debut of RFC, stick around for three more hours of the best local Charleston music you’ll find, brought to you by the only station committed to supporting the local scene this much. After the 10 PM run of RFC, it’s time for Radio Free Charleston International, where you’ll get to hear the best music from around the world. And if you miss it Tuesday, Radio Free Charleston can be heard again Thursday at 2 PM, Friday at 7 PM and Saturday at 10 AM and Midnight. Last year I raved about the first issue of Forbidden Gallery, and ACP publisher William Mull has kindly provided me with an advance digital copy of the second issue. Issue 2 is available for pre-order NOW, and I highly recommend this terrific book of mystery and science fiction with a twist, especially if you are a fan of classic EC Comics storytelling. I have to run a little disclaimer here. I am a print guy. I prefer reading comics that I can hold in my hands. And I enjoyed the first issue of Forbidden Gallery so much that I did something a little selfish. While reading the book to write this review/preview, I skipped the last page of each story. I want to save the endings for when I have a physical copy to read. So there’s a chance, however unlikely, that I may not like the endings when I get to read them. I really doubt that I will, though. However, that does not prevent me from seeing that Forbidden Gallery #2 is even better than the excellent first issue. The introductory sequence, “Wallflower,” is beautifully drawn by Craig Hamilton, and introduces a little innocent kinkiness into the book. It’s great seeing Hamilton’s work again. I’ve been a fan since he drew an Aquaman mini-series for DC back in the 1980s, and he’s still at the top of his game. “Scattercrow,” written by Mull and drawn by Karl Comendador, is a great little period Satanic comeuppance story. 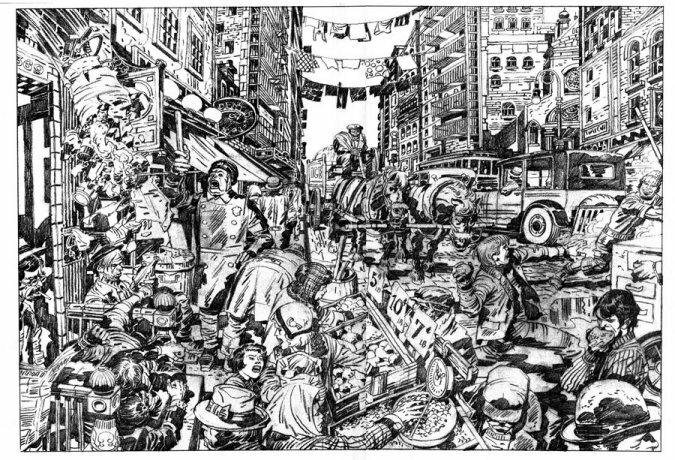 Comendador’s layouts and art perfectly serve the story. Next up we have “Reflections in a Black Pool,” written by Rene King Thompson and drawn by Tim Holtrop. This is terrific parable that mixes xenophobia with otherworldly encounters, and it’s very much in the tradition of EC Comics. Again, the art perfectly serves the story. “Pumpkin Smoosher,” by Mull and Comendador, is another winner. This time we get a classic horror/revenge/monster story that could probably be fleshed out and adapted for the big screen. “The Wire Brain,” written by Nicola Cuti, with art by Brian Postman, is a great riff on the sci fi/horror trope of medical science gone awry, with a nice sheen of drive-in-theater-style exploitation thrown into the mix. Once again, it’s a great story with great art. Wrapping things up we have “The Other Side,” written by Mull with absolutely stunning artwork by Nik Polwinko. This could easily have been published in EC’s Weird Science comic back in the 1950s. The story is great and the art is just spectacular, with hints of Wally Wood, Al Williamson and Joe Orlando combined into a new, original style. Like I said, this book is highly-recommended. There is not a bum story or art job to be found in these pages. Even the lettering and cooring are excellent. Forbidden Gallery #2 is yet another comic book that captures the sense of fun that’s too often missing from mainstream comic books. This is perfect for any fan of classic horror or science fiction comics. You can pre-order the book now HERE, and in case you missed the first issue, you can even get a package deal that includes it at a lower price. We kick off this week with a digital painting based on a photo I took just over a week ago at Three Dots and a Dash, a legendary Tiki Bar in Chicago. You might know that recently my life-long interest in almost all things Tiki bubbled to the surface after years of attempted suppression. 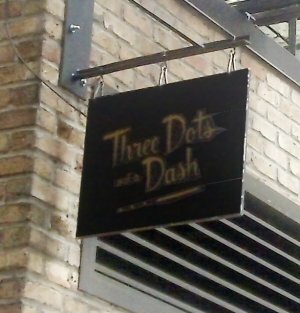 I still don’t drink or eat pork, but my beautiful wife and I had a blast at Three Dots and a Dash and plan to go back the next time we’re in Chicago. As with all editions of Monday Morning Art, click the image to see a bigger version. 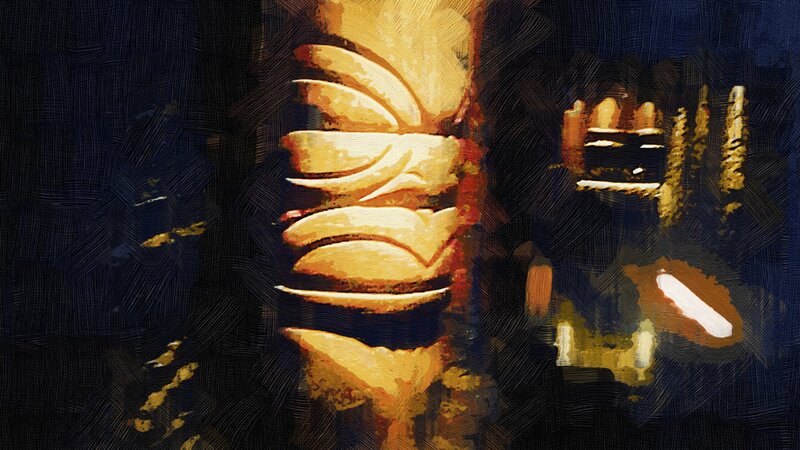 This was a digital oil painting inspired by my original, very dark, photo, which you can glimpse, fleetingly, in the Chicago Travelogue video that I put together for our trip. I posted the video over the weekend when hardly anyone is reading PopCult, so you can see it again below, just in case you missed it…or really, really like it. We have our usual excellent line up of shows on Monday, headlined by a brand-new edition of Marking Out with Betty Rock and the returning Matt BelVillain discussing professional wrestling. Marking Out can be heard at 5 PM Monday, with replays Wednesday and Sunday. Tuesday at 10 AM and 10 PM we offer up a brand new episode of Radio Free Charleston. The morning airing is followed by three more hours of fantastic local music as we bring you three recent episodes of Radio Free Charleston. The night-time airing is followed by last week’s Radio Free Charleston International. We’ve been posting the schedules for multiple days of programming on The AIR so that we don’t keep clogging up PopCult with posts about the coolest internet radio station on the planet. Nobody wants a clogged blog, and we plan to bring you more reviews than ever, starting eventually, maybe even today! It’s an exciting time here at PopCult while we pretend to be doing new and exciting things instead of just coasting while we galavant around the world, visiting cool places and not caring a bit about things back home. Uh, yeah, that’s not us at all. Notes on the schedules you see posted: Instead of Six Degrees of Separation Monday, we will be re-broadcasting our live Go Van Gogh music special by popular demand. Also by popular demand, The Life Speaks Eclipse Special from last Monday will be replayed this Monday at 1 PM. Radio Free Charleston will be new this week, with brand-new tunes from Byzantine, Bobaflex and more, but as I type this, the show has not yet been recorded, so I can’t exactly give you a playlist, now can I? Monday afternoon look to PopCult for a review of the second issue of Forbidden Gallery, along with information how you can get your grubby little mitts on a copy for your own self. It’s a really cool, exciting time to be alive, if you don’t mind all that awful stuff that’s happening in the corridors of power. Tonight’s Sunday Evening Video is a travelogue of my recent trip to Chicago. Some of you may remember that, three years ago, your PopCulteer snuck off to Chicago to wed his longtime love, Melanie Larch. Our third anniversary was actually August 26, but to celebrate this year we decided to head back to the city of wind a week early so that Mel could see one of her acting heroes, Amy Morton, in the play, Hir, which was due to close just before our anniversary. We’ve been returning to Chicago two or three times a year since our wedding, and we do love the place. It’s vital, invigorating and we never stay long enough to start to hate it. 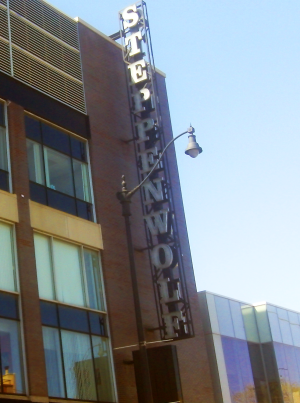 On this trip we hit up a few of our favorite places, Steppenwolf Theater, where we saw Hir (and where we got married), Quake Collectibles, Rotofugi, Laurie’s Planet of Sound. We also made some new stops, like Three Dots and a Dash, American Science Surplus and Blick Art Supplies. I decided to make a video slideshow this time because since one of the blogging software updates a year or two back, I can’t really post the long photo essays that used to be PopCult trademark. So now, even though I really sort of hate slideshows (as a reader I prefer to linger over the pictures that interest me), I slapped together a video, and I have to admit that it came out pretty good. As for the trip, it was fantastic. 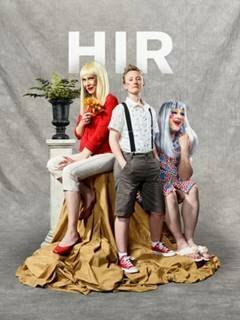 Hir is a remarkable play that is very hard to describe. I called it a “slapstick tragedy” at one point. It’s a very hilarious play about broken people badly hurting each other. Afterward, you sort of feel bad for laughing so much. The performances were amazing. We saw Amy Morton in Who’s Afraid of Virginia Woolf a few years ago at Arena Stage in Washington DC, before that production began its Tony-Award-winning run on Broadway, so we knew she’d be incredible. Francis Guinan was just exceptional in role that had to be difficult to figure out. Em Grosland and Ty Olwin rounded out the small cast, and each actor was at the top of their game. The play itself is hard to describe without giving away too much. An Iraqi vet is dishonorably discharged and returns home to find utter chaos. His father has suffered a stroke. His former sister is transitioning and requests the use of new pronouns, “ze” and “hir.” His mother has stopped doing anything resembling housework and as a result the house is a complete mess. This is a family that is so far beyond dysfunctional that, even though the situations often are so funny that you can’t help but laugh, the play winds up in a very dark, gut-wrenching place. It was an outstanding production of a very gutsy play. After the play Mel actually got to meet Ms. Morton and they had a very pleasant exchange about acting. We also made it to Three Dots and a Dash, one of the country’s most acclaimed Tiki Bars. Since neither of us drink, we didn’t really know what to expect, but what we got was so much fun that this Tiki Poser can’t wait to return on our next visit. They had no problem making alcohol-free versions of their signature cocktails, and the food was just terrific. I had a “virgin” Jet Pilot (ginger ale, bitters and cinnamon) and Thai fried chicken, and it was fantastic. The ambiance was superbly sublime and the service impeccable. We always have fun in Lincoln Square, visiting Quake Collectibles, Laurie’s Planet of Sound, Merz Apothecary, Enjoy: An Urban General Store, and Geddings Park. On this trip we made it a point to ride the “L” more often that we had previously, and wound up in a cool area, near Millenium Park, that includes Blick Art Materials, Graham Cracker Comics and Reckless Records (where I managed to score the one Record Store Day release I wanted that managed to elude me when we were in Chicago back in April). I always do my best to build up and support the local scene here in Charleston, but it’s refreshing, after years of toiling as a caregiver, to finally have the chance to travel and see how other cities balance their cultural side with everyday life. Despite the ridiculously bad rap that Chicago gets in the press, we always feel safe there. The Loop and various commercial districts seem safer to me than many parts of Charleston. I know that the panhandlers in Charleston are far worse and much more aggressive than in Chicago. It’s nice to visit some place and come back with fresh ideas on how we could make things better here. Bicycles are a big deal in Chicago, but that’s because the city is flat, and people will actually take advantage of bike lanes and public bike systems like Divvy. Charleston would be well-served to concentrate more on improving and expanding their mass-transit service than on wasting resources on bike lanes that are only going to be used by a small fraction of the population, and only in good weather. We rode the “L” extensively on this trip with no trepidation. You couldn’t pay me to get on a KRT bus. 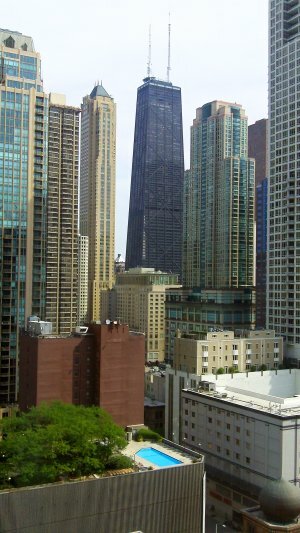 There are a lot of wonderful things in Chicago that are only possible because of the population density. I can’t see Charleston supporting a Tiki Bar like Three Dots and a Dash. We simply don’t have enough people who are willing to patronize such a cool place often enough to make it economically viable. Of course, Charleston has its advantages too. There are entire sections of Chicago that we avoid because we don’t want to be shot on sight. While population density is nice, it’s also cool to be able to go to a first-run theater on a weekend matinee, and have the place to yourself. And driving in Chicago is not something any sane person would want to do on a regular basis. We love going there, but we also love coming home. Anyway, we had a blast. I didn’t take nearly as many photos or shoot as much video as I normally do, because this was our anniversary trip. I hope you get a kick out of the travelogue, and get ready for more videos like this in the future, because while I prefer posting lots of still photos, the blogging interface does not like it when I do that. 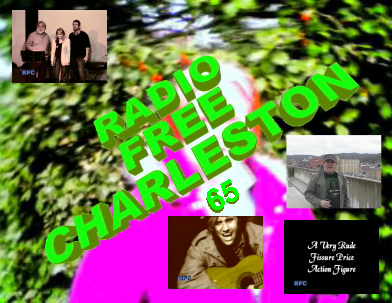 Radio Free Charleston 65, “Give Peace A Chance Shirt,” was first posted April 8, 2009. 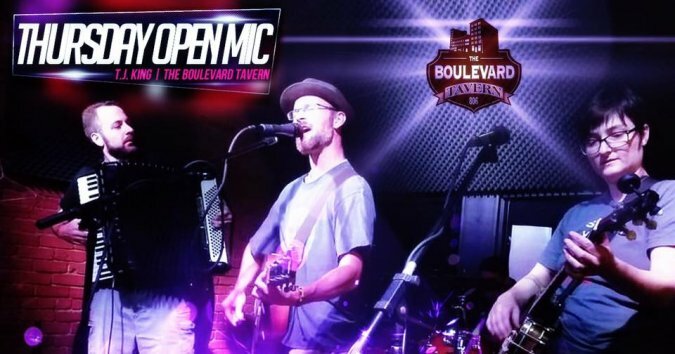 This episode showcased two songs performed by Bare Bones, an acapella group consisting of Bill Kimmons, Becky Kimmons, and Mark Davis. We also present the short film “FOOTLUCY”, starring the late Joe McComas. Plus, there’s animation by Wallace Padillo. Original production notes are here. If it seems odd that I keep saying “Bare Bones Acapella,” rest assured that it’s all in your perception and is not a sign that I thought the word “acapella” was part of their name. 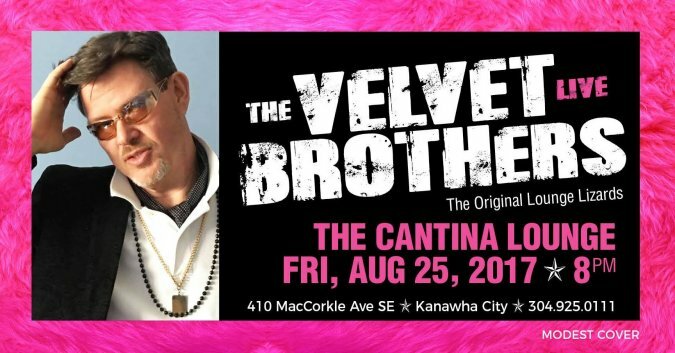 The Velvet Brothers Live At The Cantina! So this mornig as I hastily tossed together the PopCulteer, I was happy to discover that The Velvet Brothers were playing at The Cantina in Kanawha City tonight. I had to rush out for a check up for my new eyes (got ’em back in May, in case you weren’t paying attention) and remembered that, back in March, Mel and I recorded almost twenty minutes of The Velvet Brothers at The Cantina and, except for playing the audio on the Radio Free Charleston radio show (heard many times every week on The AIR), I had not yet done anything with the video. See, I was still a couple of month’s away from cataract surgery when we shot this footage, plus I was also still on prednisone for Myasthenia Gravis, and at the time I didn’t have the sight or the patience to edit much video. But now my eyes are fine. I have patience, and I may well be back to my old form in terms of speed-editing. I cut this video in twenty minutes Friday just before noon. It took a while to render, but here it is. Shot on March 31, 2017, this is the Velvet Brothers in all their gloriously lounge-y splendor, performing at The Cantina in Knawha City. Enjoy, and go see them tonight in KC, folks. You’ll hate yourself in the morning if you don’t.